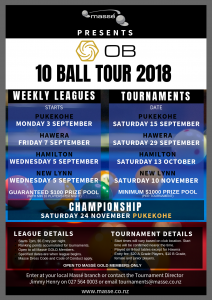 Join the OB 8 Ball Tour this year! Takes place at Massé Pukekohe, Hamilton, New Lynn and Hawera branches at 7pm from 3rd September 2018. This league will run for approximately 12 weeks. It is a singles game and only $5 entry fee per night. If there are 10 players or more there will be a guaranteed $100 prize pool each night! Points are accumulated and you will be able to see your ranking each week on our website. Earn extra points by playing in tournaments which take place at each club branch. Each tournament has a minimum of $1000 prize pool! This year we are offering trips to go overseas to play in an international tournament of your choice in 2019! Your flights, accommodation and entry fees will be paid by Massé. This opportunity will go to those players with the highest points. Play in our leagues throughout the year to accumulate your points for chance to be in to win a trip! • Play starts at 10am – 11am – depending on which club branch – start time will be confirmed nearer the time. • Entry fees are: $20 A-Grade players, $10 B-Grade players, female and junior players.